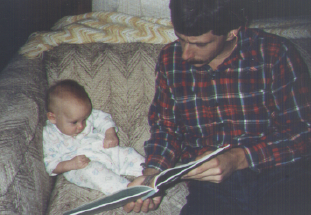 While looking through old photos recently, I came across one of my dad reading to me when I was a baby. He and my mom always read to me because they knew it helped me fall asleep faster and also because they wanted me to be well-read. When I was a baby, I used to try to reach for the newspaper whenever Mom and Dad read it. So sometimes they put the paper in my crib and I’d “read” it (aka sit on it and get covered in ink.) I’m not sure what they were thinking in doing this, but I often joke that this is why I became a journalist. Of everyone in my family, Dad read to me the most. This picture I posted above reminds me of what a great father he is and of how lucky I am to have him. It also reminds me of a great story I read in The New York Times a couple of months ago about a father who read to his daughter throughout her childhood and into her college years. The night I came across it, I read it out loud to my dad on the phone. Even though he lives in Massachusetts and I live in Florida, we still find ways to share father-daughter moments like this. I appreciate every one I can get. Mallary, it’s easy being a great dad when you have a great daughter like you!